U.S. Sen. John Kennedy (R-La.) issued the following statement today on the state’s selection of a contractor to manage the $1.6 billion recovery program for victims of the March and August flooding. For those who aren’t up to speed on the flood recovery contract mess Kennedy is lambasting the governor over, the basic points are these: Louisiana has to date been allocated some $1.6 billion from the federal government for flood recovery purposes, and the state Division of Administration is working through its Office of Community Development to let a contract to a private firm to manage the distribution of those funds to construction companies and others in order to complete projects to bring the affected areas back to where they were pre-flood. The contract was bid, and there were three bidders, each of which was a consortium of several companies involved in various disciplines pertinent to a flood recovery effort – information technology, governmental relations, construction, etc. The winning bid was a consortium headed by a North Carolina company – Innovative Emergency Management, or IEM, whose bid, at $250 million, was $60 million below that of a consortium headed by CSRS, a Baton Rouge architecture and engineering firm, and $100 million below that headed by a Houston construction company called Sullivan Land Services. IEM has a number of licensed construction firms in its consortium, but at the time of the bid IEM itself did not have a license from the Louisiana State Board of Licensing for Contractors. They subsequently acquired one, after CSRS complained about IEM’s licensing status. 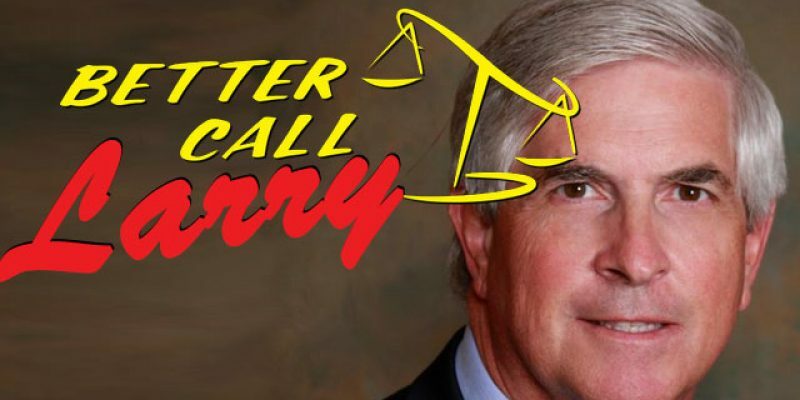 But that wasn’t enough, according to OCD – who was acting on the recommendation of the licensing board’s executive counsel Larry Bankston – a former state senator who spent nearly four years in prison for accepting a bribe from a video poker operator in the 1990’s. Bankston’s son works for a subsidiary of Sullivan Land Services, though he denies there is a conflict of interest. You are to be excused for doubting his credibility on this issue given his past. It turned out that CSRS had its own issues with respect to licensing, which depending on how this mess shakes out could be a fatal flaw in its own bid. What’s more, Bankston’s qualifications to make such judgements on contracts of such magnitude are themselves. 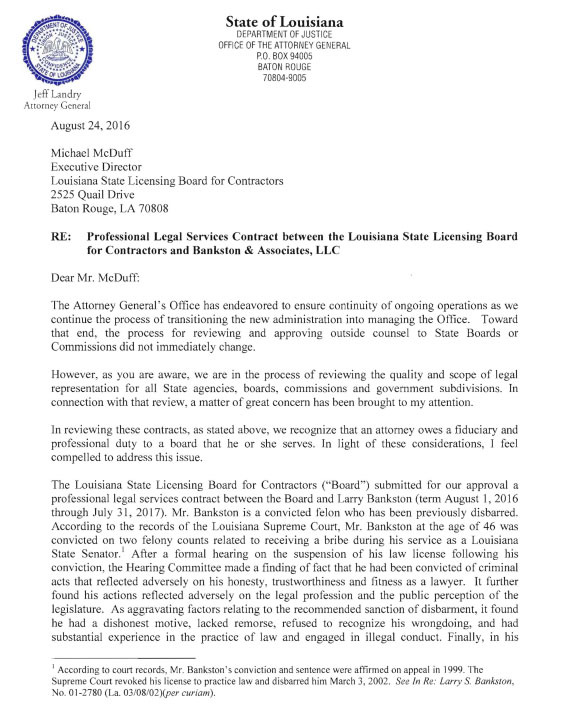 His own contract to serve as the licensing board’s counsel was supposed to have been approved by Attorney General Jeff Landry, and Landry made headlines last August by specifically denying approval to Bankston’s contract on the grounds that as a convicted felon he was unfit for such duty. 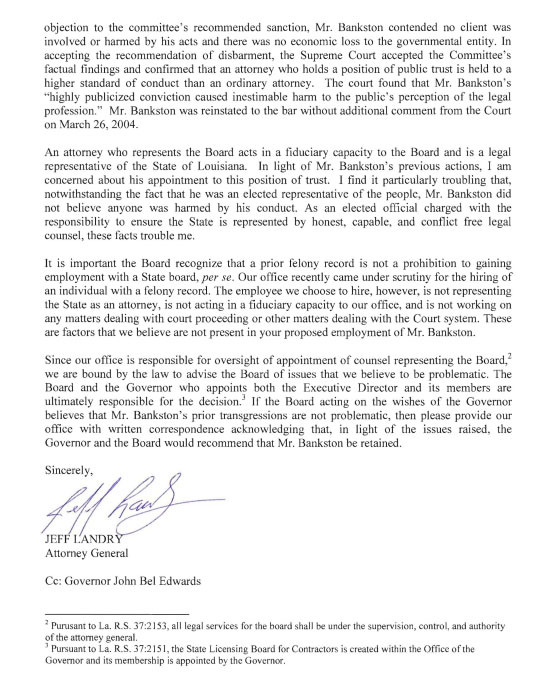 Landry therefore comes off as a sage or a prophet, but with the caveat that if the attorney general denied Bankston’s contract, why is Bankston wielding the power of the executive counsel’s office at the licensing board? Why isn’t someone else doing that job? And that is troubling, indeed. Landry later acquiesced to Bankston’s contract, under fire from the licensing board and Mike McDuff, the longtime Jay Dardenne supporter who went with Dardenne into Edwards’ camp. He’s now fuming with regret over not following his original instincts – and he’s also not happy with the local media, which played the Bankston contract issue as petty politics by Landry in his “feud” with Edwards rather than what it actually was. And thanks to that shallow and insipid reporting, a major appearance of impropriety if not a full-on scandal was not prevented. The good old boy network got its man, and now Louisiana’s flood recovery contracting looks like an irretrievable mess. And Kennedy isn’t by any means the only one asking questions about what seems to be a burgeoning scandal. Previous Article Say, John Bel…Where’s Your Tax Plan?